We recommend Express Shipping to ensure delivery in time for your trip. The Travelrest All-In-One Travel Pillow is the premium travel pillow you’ve always dreamed someone would create! By popular request, we are proud to introduce our All-in-One travel pillow! It combines our original Travelrest and luxurious velour cover with memory foam inserts, making it the most luxurious travel pillow on the market. Even without a seat back, inflatable Travelrest's versatile design provides excellent support - simply sling the tether cord over your head and shoulder... and relax. It's The Travel Pillow, Reinvented! 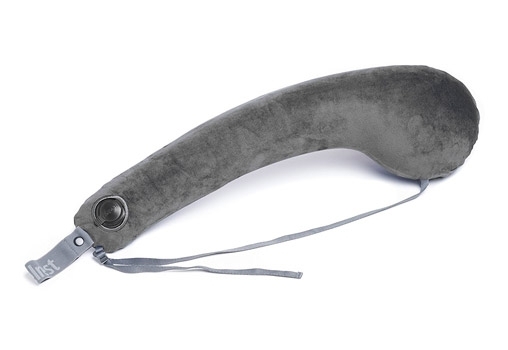 Features a plush, washable velour cover for softness, with memory foam inserts and full lateral support for the upper body making it easier to relax, fall asleep, and stay asleep longer. 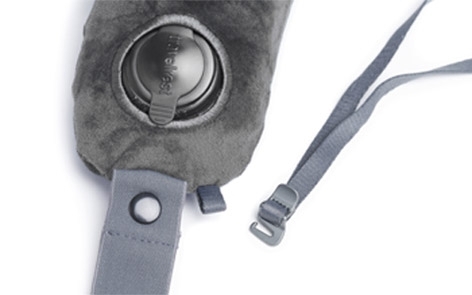 With its patented ergonomic shape, the Travelrest inflatable travel pillow attaches to the 'wings' of an airline seat, headrest of a car, or can be worn 'messenger bag style', nestling against the head and neck to provide support and comfort in flight or on the road. Compact and easily attaches to your luggage. Can be used by adults and children. Great for airplanes, buses, trains, cars, camping, backpacking, wheelchairs, airport terminals, watching TV. 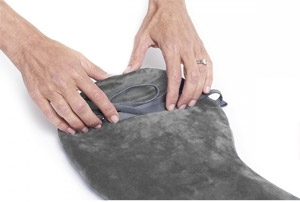 3-4 easy puffs to inflate and a simple tap on the flap to deflate. Stores neatly when rolled to minimize packing space. Snaps to outside of carry-on bag, purse or backpack for easy access. Simple one-button inflation adjustment for maximum comfort and attaches to seat with a fully-adjustable cord-lock mechanism. Easy to remove cover for washing. Wash on gentle - Line dry. Wrap your pillow in its luxurious velour case. Gently slip the memory foam inserts into their pockets. 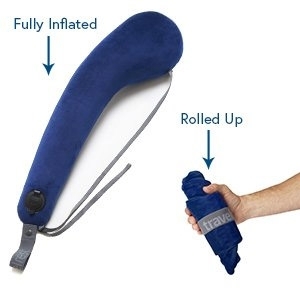 Inflate with just 3-4 breaths. Loop the cord around the backrest or headrest then pinch lock and pull cord to tighten. Position across or beside your body for maximum comfort. Adjust the softness to suit your personal preferences with just the press of a button. Loop the cord over the tail and snap shut. Position your pillow in the most comfortable position for you. Part of HiGear Design, Inc., Travelrest offers products that allow travellers to enjoy better sleep and comfort. Founded by John Mittelstadt, the idea was born during his frequent travelling to Asia. His constant struggle with sleep aboard airlines, led John to create inflatable travel pillows, travel blankets, memory foam travel pillows, sleep masks, and luxurious pillow covers. As a small family business, Travelrest remains grateful to its patronising customers for believing in their products. So comfy and so easy to use. I tried it several ways and by far my favorite is hooked onto the head rest. For the first long haul flight ever, I think I managed a 5 hour block of sleep (disclaimer - I’m pretty good at sleeping at the worst of times anyway, but even this was exceptional for me). 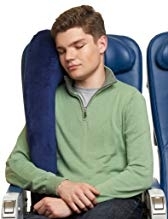 Very easy to use on the plane in small cramped spaces and it didn’t leave me with a stiff neck like traditional neck pillows do. By anchoring it on the head rest, it also didn’t move with my body as I slumped into a deep sleep which provided me with so much more support. The long design also meant I could almost “hold on”.